New and shiny Dandelion… | 15,000kms of Food! 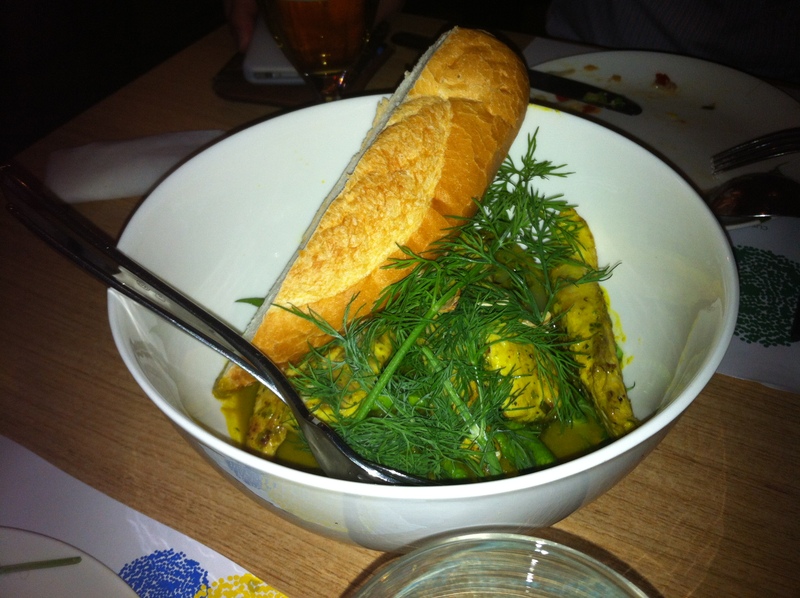 Took me 5 weeks to get a table at the current “it” darling restaurant Dandelion… and was it all that? Yes! Hyped up by numerous food reviews, lack of seating (even on a Tuesday night! 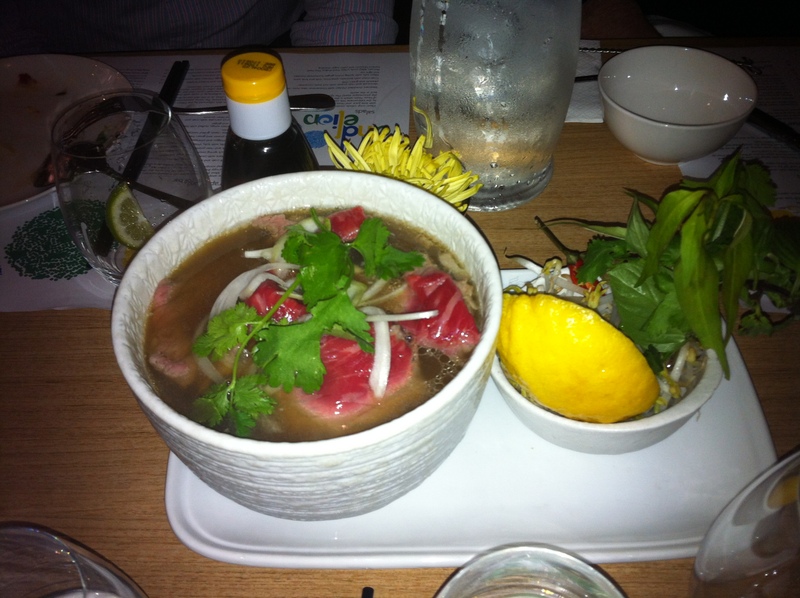 ), and the infamous wagyu pho noodle soup…. I had to go! Our booking was for 8.30pm on a Friday night, and thankfully, there were no hiccups in the booking other than one of my dinner party being an hour late! As I sat there with a few wines, the procession of dishes going past to the other tables had my tummy rumbling the whole time! 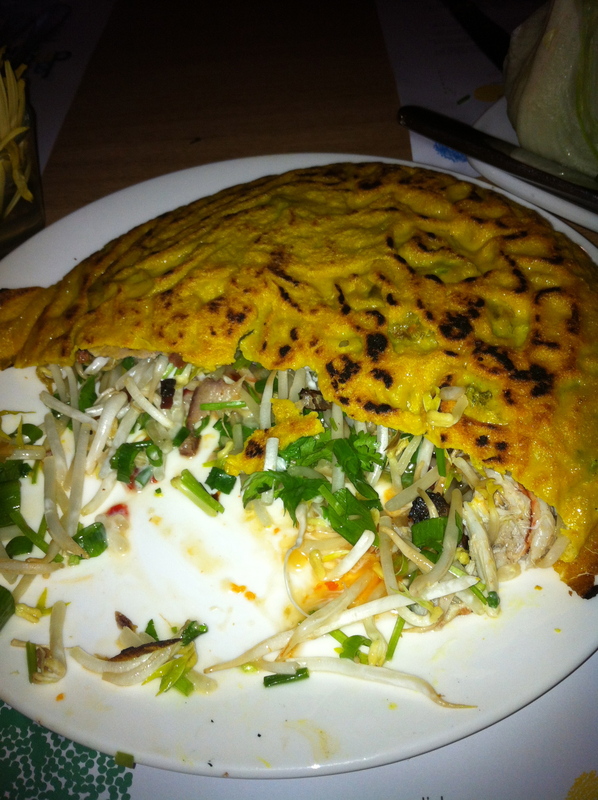 First up we had the “sizzling coconut pancake with crab and BBQ pork and bean sprouts“… the dish was light and tasty, and given I had to wait over an hour before the first dish (as one of the dinner attendees was late), this poor dish was smashed down. We tucked into it before remembering that we needed a photo for the blog! Next up was the “Wagyu beef pho, with raw sirloin and braised brisket“. Most of you would know pho from the deep depths of Springvale, Richmond, Footscray, etc and the homely taste of the soup stock infused with herbs. This tasted almost exactly the same but cleaner/clearer… and of course the produce used was exceptional (wagyu can do no wrong). It was divine, definitely will be going to try the other varieties such as mud crab claw and raw tuna. The Yellowtail Kingfish, green papaya in a turmeric curry with snake beans and dill was the least memorable dish of the evening. It was the least memorable only because it had to go up against a raft of excellent dishes. Overall, it tasted good, and the fish was extremely fresh but lacked spiciness. 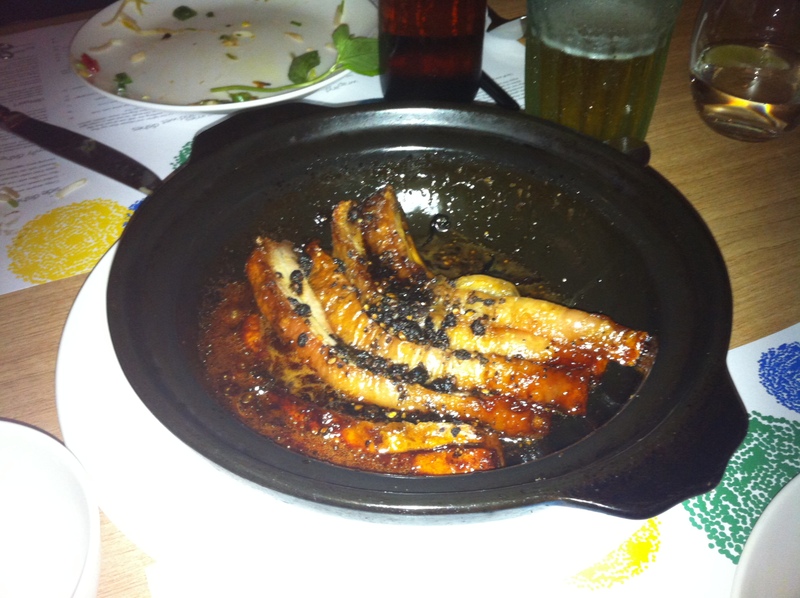 The winning dish of the evening was the pork belly, simmered with caramel and black pepper, in a clay pot. It was divine! The pork was soft and succulent, and the caramel sauce was sticky and flavourful and the sizzling smells were intoxicating! 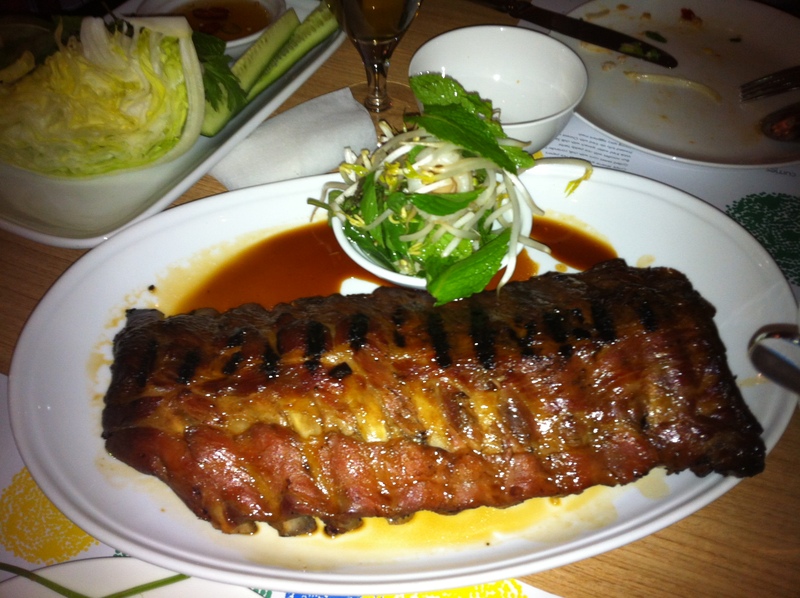 BBQ Spare ribs with a refreshing lychee and mint salad. Nothing more to say. Just do it. Unfortunately, Asian desserts just don’t cut it for me. We gave some of them a go, but if I were to have my time at Dandelion again, I would skip the desserts and order extra mains! 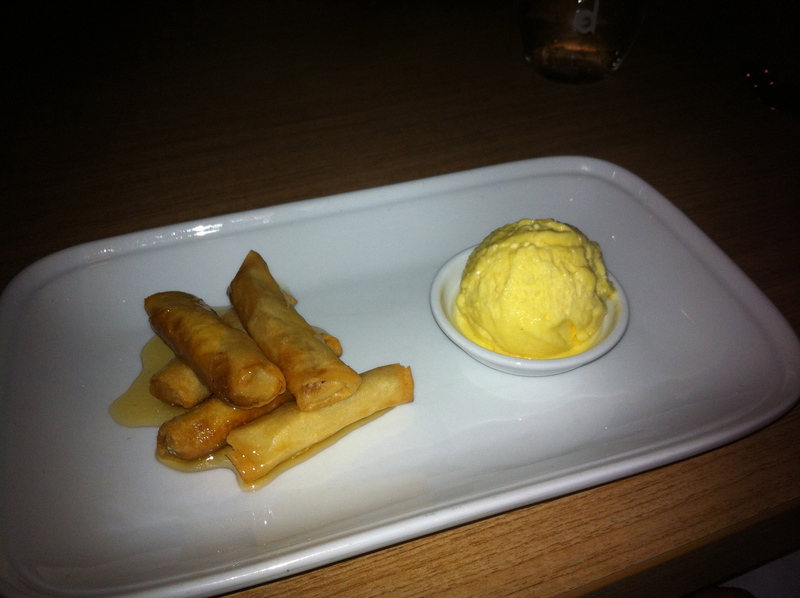 Banana spring rolls with passionfruit sorbet… a take on the old favourite banana fritter. The sorbet was a winner, not the spring rolls. 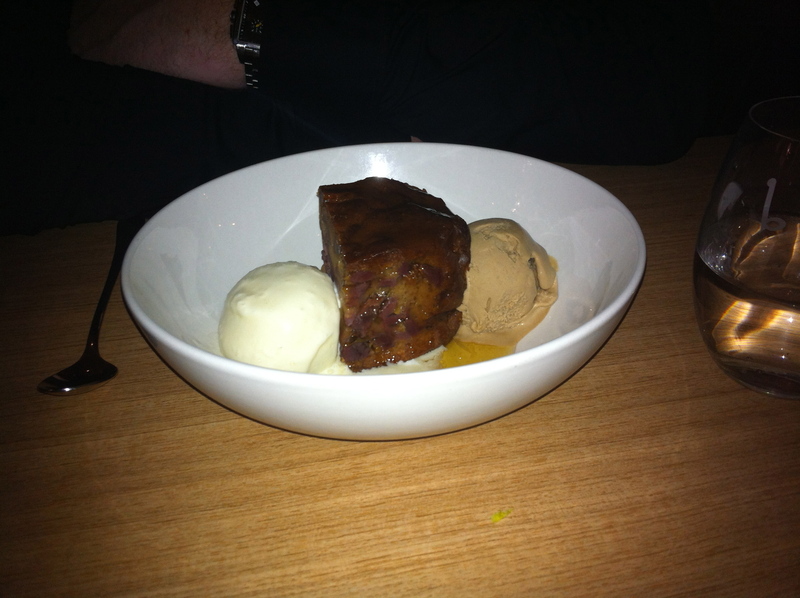 Caramelised banana cake, tamarind ice cream and coconut ice cream… it was good, but not great. All up, a great dining experience. Service was prompt and friendly, food came out at a great pace, and most importantly, food came out tasting sensational. I would go back, to have a few repeat dishes and to try new ones. And definitely giving up on the desserts. Previous PostSan Francisco: Crab House and Dottie’s True Blue CafeNext PostLand of celebrity chefs… Las Vegas!